It was the Greek Historian Xenophon, I believe, who said, 'A king should not only prove himself better than those he rules, he should cast a spell on them.' That is, cast a spell on them by the excellence of his thought and action, by the totality of his commitment to his vision and mission, and by the quality of his living and being. A close look at Rama's life shows us that he, a man from a period much earlier than that of Xenophon, fully believed in this. That is one of the reasons why his life gives us so many invaluable lessons even for our age separated from his from a few millennia. One of the most important lessons Rama's life gives us is in self-mastery, at which he frequently falters, as all human beings do, but invariably triumphs. To look at how Rama falters again and again and eventually masters himself every time is as fascinating to do as it is rewarding. Rama's failures and triumphs are invaluable lessons for all human beings, and particularly so for men and women in leadership positions who are expected to lead by example and set role models for others to follow. The most beautiful example for this could be found in the Ayodhya Kanda of the Ramayana. On that fateful Pushya morning when he was supposed to be installed as the crown prince of Ayodhya, the first major crisis of his life takes place. The previous evening he had been called twice to his father, King Dasharatha, the first time to be informed that he would be crowned the next day and the next time, to give advice regarding his role as a crown prince of the Ikshwakus, who have been kings for generations and have produced several legendary kings. The first meeting is very formal and takes place in the assembly. The second one is informal and intimate, and takes place in the antahpura [inner palace apartments]. On the day his coronation was supposed to take place, early in the morning Sumantra, the minister, comes and informs him that he is wanted at Queen Kaikeyi's palace, where the king is waiting for him along with the queen. Rama believes it is with regard to something in connection with the coronation ' perhaps Kaikeyi is not able to contain her joy at the news. He goes there, accompanied by his brother Lakshmana and several friends. He leaves his friends behind as he goes to the queen's chamber ' we are not sure whether he takes Lakshmana with him or not. There is no reason for him to leave Lakshmana outside: the two brothers are inseparable and he is going to meet his father and step-mother, who has all along been as loving and close to him as his own mother. However, the text perhaps implies that he went in alone into Kaikeyi's chamber. He asks Kaikeyi what has happened ' his main suspicion is that he has done something that has made his father unhappy with him. Or maybe, the king is now well. Kaikeyi assures him he has done nothing wrong, nor is the king suffering from any ailment. The king's problem is, she tells Rama, that he made a promise to her a long time ago and now he does not want to fulfil that promise. She also adds she would tell Rama about it all if he promises to do whatever the king wants, whether it is good or bad. The very idea that he would not fulfill a wish in Dasharatha's mind is shocking to Rama and he tells Kaikeyi as much. He tells her he shall jump into fire at one word from Dasharatha; he shall eat deadly poison, if that is what he wanted, or drown in an ocean. He vows that he would do whatever the king wants. He assures her 'Rama does not speak two things.' He would stand by whatever he says once. Kaikeyi now tells Rama that Dasharatha had long ago given her two boons and using them she has demanded that Bharata should be crowned as the crown prince in Rama's place and Rama should go on an exile to the Dandaka forest for fourteen years. She asks Rama to now fulfil the king's promise and save Dasharatha's truth. She wants Rama to leave for the forest that very day. In spite of the Ramayana repeatedly telling us Rama was not upset by what he was told, we see that Rama is deeply distressed. Those are the words of a deeply upset mind, for his father has no reason that morning to talk to him happily as he always does. According to Valmiki Ramayana, was Rama then affected by the news or not? Did he lose mastery over himself when he received the news or not? These two are really two different questions and not one question put in different words. This verse makes the answers to the two questions above very clear. Was he affected by the news or not? The answer is, yes, he was, to the extent that he became sad and there was at least the threat of his losing control over his senses, if he did not actually lose it. [In Sanskrit literature, the senses are usually ten: the five sense organs like the eyes and ears, and the five organs of action, like the hands and legs. Sometimes the mind is counted as an eleventh sense organ]. But did he lose control over himself? Not really, and if he did, it was only very temporarily. For when he enters his mother's mansion, we find he is able to hold his sorrow in his mind, his senses are in full control and he is a master of himself. Self-mastery is not never losing control over oneself. It is not never being affected by bad news or sad events, or good news, for that matter. True self-mastery is when you are able to hold yourself together in spite of being affected by these. And that is exactly what Rama shows. Rama is a very deeply emotional individual. I think of all our epic heroes, he is the most emotional. And people with emotional depth are easily affected by the events around them. Rama is repeatedly affected by the events around him, by all major events in his life. But every time he gives in to his emotionality, he controls himself and becomes a self-master again. That is exactly what he does before his mother Kausalya. Kausalya in Valmiki's Ramayana is like Dasharatha ' extremely sentimental and weak, unable to take stress, and prone to faint under strain. Besides, she has suffered much in life because of the king's affection for his younger and clearly more talented and attractive wife, Kaikeyi. When Rama enters his mother's palace, Valmiki tells us, he is a master of himself, in spite of being deeply distressed. On the way to the inner chambers of Kausalya's palace, Rama meets in the outer sections of the palace 'a very elderly, revered man, seated at the door' [probably the kanchuki, officer in-charge of the women's quarters], numerous other men around him, groups of honored Vedic scholars, and several young and old female guards. None of them suspects either from Rama's face or his manners that anything dreadful has happened. When Rama sees Kausalya, she is engaged in a ritual worship for his welfare. Such is Rama's mastery over himself by now that his mother sees nothing amiss in spite of the fact that Rama's coronation has been cancelled, he has been ordered to go on an exile into the dreadful Dandaka forest for fourteen years, it has been decided the crown of Ayodhya would go to Bharata instead of him and Rama is deeply distressed [bhrsam ayastah] about all this. Rama greets her, she gathers him in her arms and speaks words of blessings. She then invites him to take a seat and offers him food. She still has no clue about Rama's inner condition because of his supreme control over himself ' she gets to know of what has happened only he himself tells her of it. The news devastates Kausalya when she hears it. She swoons and collapses. Rama gathers her from the floor and raises her up. Kausalya laments that she has never known joy in her life, has never once known the joy an eldest queen should know. She tells him she was living under the hope that once Rama became the ruler, she would be able to know the joys she was denied during the day's of her husband's power. She says the other wives of the king have constantly been insulting and humiliating, even when he, Rama, was around, and if he went away she would certainly die. In the palace, she wails, her status has been that of the servants of Kaikeyi, or even worse. Rama loves his mother deeply. He sees her misery and it powerfully moves his heart. But that does not make him lose his control over himself ' he knows it is not weakness that would give his mother the strength she now needs more than at any other time in her life. It is Lakshmana who loses his hold over himself and gets into a violent fury. In his fury Lakshmana says many unforgivable things. He wants Rama to capture power by force and says if anyone stood in his way, he would make the entire Ayodhya devoid of people [nirmanu'yam ayodhyam kari'yami. [2.21.20] He says he would slay anyone who took Bharata's side or desired his welfare. As for his father, Lakshmana says if he turns an enemy goaded by Kaikeyi, then he should be either imprisoned or if necessary, killed. He swears his loyalty to Rama and tells Kausalya that he will kill Dasharatha who has become obsessed with Kaikeyi and has turned stupid in his old age. 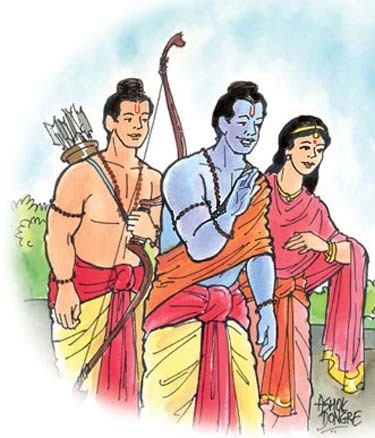 Kausalya tells Rama he has heard what Lakshmana has said and if it appeals to him, he should act on it. Rama is now a master of himself, unlike Lakshmana and Kausalya, however devastated he is deep within himself. He tells his mother he would follow the path followed by other great men in the past, who have obeyed their father even when what had to be done was great evil, like Sage Kandu who killed a cow [one of the gravest sins in Rama's society] in obedience to the wish of his father; even when some of them met with great calamities in obeying their father, as happened to the sons of his ancestor King Sagara. He admonishes Lakshmana and asks him to forget the ideas suggested to him by the evil kshatra greed for power, and follow the path of dharma as he himself was doing. As for himself, he wouldn't give up dharma for the sake of something as small as a throne. He blames all that has happened on daiva, Divine will. Or else why should Kaikeyi who has never once in the past made any distinction between him and Bharata, now do what she has done, he asks. Eventually, after a lot more arguments among them, Kausalya gives Rama her blessings to go to the forest and agrees to stay back in Ayodhya awaiting his return, giving up her demand that he take her with him. The strain of keeping himself in control, however, takes its toll on Rama soon. The imperviousness that he maintained before Kausalya deserts him as soon as he leaves her apartment. He would be very different when he enters his wife's chamber. Rama is a dreadful sight when Sita first sees him after he had left early that morning. She has no idea of the new turns events have taken. But one look at him, Sita starts shivering. The Ramayana tells us here that at the sight of Sita, Rama could no more retain his control over his sorrow and his grief came out in spite of himself. His face loses all luster, he is perspiring all over. This is a man who has failed in keeping his sorrow in check, who is no more in control of himself. We see something of tremendous beauty here. Before his father, who is deeply sentimental and psychologically weak, Rama keeps his mastery in spite of being deeply affected. In front of his friends, who look up to him as their leader, he maintains self-mastery. He maintains self-mastery again in front of his mother, to whom it is his duty to give strength in her moment of crisis ' for the crown being withheld from Rama is a greater tragedy to her than to Rama himself; she has been all her later years with the single hope that one day he would become king and she would reclaim the position she had lost when Kaikeyi became the king's favorite wife. But in the presence of Sita, his wife, who is emotionally as strong as he is, if not more, he allows his emotions to overpower him for the first time. During this breakdown, he would tell Sita a lot of things that would never occur to him if he were a master of himself. After informing her about what happened in Kaikeyi's chamber, he tells her he is going on exile and she should stay back at the palace. He then gives Sita instructions about how she should conduct herself from then on. He tells her she should never talk of Rama in Bharata's presence! Because men in power do not endure other people's praise, she should never extol Rama's virtues in Bharata's presence, particularly so while talking to her [girl] friends! Now that Bharata is in power, Sita should always try to please him! After this breakdown in Sita's chamber, he would once again regain command over himself. This time he would maintain his mastery over himself until after he has left Ayodhya, crossed several rivers, and has finally crossed the Ganga and is in the forests beyond it. There, for the first time alone since he received the order of exile from Kaikeyi, with just Sita and Lakshmana with him, in the loneliness of the jungle, with night cutting him off from the rest of the world, he would again let go of himself and breaking down, wail aloud, filling the forest with his grief and sorrow. But before going to that, let us see how he maintains, with a supreme effort of will, mastery over himself throughout the rest of the agonizing day and the following days and nights until he reaches the forest across the Ganga. In Sita's chamber, Rama has to give in to Sita's demand to be taken with him to the jungle. All his arguments against it prove futile. Sita proves here she is a woman of iron will and gets her way. Sita has no grief over the loss of the kingdom, but that she would have to live separated from Rama is intolerable to her. In her agony at the thought of being forced to live in Ayodhya, of being denied Rama's company and the opportunity to serve him as his wife, she momentarily loses control over herself and insults Rama, questioning his masculinity itself, but Rama himself never loses his hold over himself. Later he agrees to take Lakshmana too with him. It is as a master of himself that Rama does the many things he has to do before he leaves for the jungle on the same day as desired by Kaikeyi. He distributes wealth among brahmanas; gives diamonds and ornaments to Guru Vasishtha's son Suyajna and his wife and to lots of brahmacharis, friends and servants. He also distributes his remaining wealth among the poor, the old and children. And in the middle of sorrow that is engulfing all of Ayodhya, Rama amazingly becomes light-hearted and has some innocent fun at the cost of a brahmana. The brahmana lives in the jungles near Ayodhya. He is old, yet such is his lifestyle that he glows with spiritual power. The man has a young wife and several children and, unable to find food for them and for himself, he used to always roam around jungles with digging tools in his hand searching for roots and gathering fruits from trees and bushes. His wife very reluctantly addresses him asking him to go to Rama seeking some cows. Rama smiles amused at the wiry old man's sight and shows him a huge herd of several thousand cows. He gives him a staff and asks him to hurl it as far as he can and tells him that all the cows within the fall of staff will be his. The brahmana tightens his dhoti and hurls the staff with all his strength. Such is the brahmana's strength that the stick falls on the other bank of the Sarayu. Rama happily gives him all the cows that stood within the fall of the staff. Still smiling, he apologizes for asking the brahmana to do what he did. He says he did what he did to see how much spiritual energy that wiry body of his contained. He tells him that all his wealth belongs to brahmanas and the needy and asks him to ask for anything else he needed. This is a young man who has just lost his kingdom, snatched away from him moments before his crowning, and has been given an order of exile for fourteen years. Rama now goes once again to Dasharatha ' to take leave of him. Dasharatha begs him to stay for one more night ' but Rama knows that is no solution to his father's problem. By staying back he would only increase Dasharatha's agony. He refuses. There are moments when, during this meeting of the father and son, in spite of his self-mastery Rama's pain and despair show through his words. For instance, while telling his father that the only desire in his mind is to see that his, Dasharatha's, words [to Kaikeyi] are not broken, Rama says: 'I have no desire for the kingdom, nor for the earth, nor happiness; I do not desire any of these pleasures, or heaven. I do not even want to live.' This is not what he will say two days later, when he is away from Ayodhya and alone with his wife and brother in the jungles beyond the Ganga. Rama's pain and sense of loss come through in his other words here too ' for instance, when he repeatedly says how happy he would be surrounded by quiet animals and listening to the chirping of birds in the jungle; how contented he would be eating the fruits and roots of the jungle and seeing the mountains, lakes and rivers. Of course, it is possible that Rama is, reversing roles, trying to console his father, rather than Dasharatha doing so to his son. Even in this moment of crisis, he knows fully well his duty as a son: be the old father's strength in his moment of debilitating weakness. He not only shows strength and courage, thus imparting to Dasharatha these, but also reminds his father it is his duty in this moment of crisis to give strength to those around him. In spite of Rama's brave words, the father senses his son's feelings and faints. Rama's self-mastery is clearly visible again during the scene when the princes give up royal clothes and change into ascetic clothes in preparation to going on exile to the Dandaka forest. In a touching scene Sita too tries to wear ascetic clothes following Rama and Lakshmana, fails and stands confused and embarrassed. Rama comes forward and helps Sita wear the clothes. This is a scene that would break anyone's heart ' while Rama has been ordered to live in jungles for fourteen years as an ascetic, there are no such compulsions on Sita. She is doing what she is doing out of her love for Rama. The whole royal family watching it breaks down but there is one man totally unshaken by it: Rama. The women of the antahpura beg Rama not to take Sita with him, but to leave her in the palace, but Rama without paying any heed keeps helping his wife wear her new clothes. Such is the poignancy of the scene that old Sage Vasishtha, a man of full self mastery, too loses his control over himself and, tears flowing down from his eyes, shouts in rage at Kaikeyi, calling the queen evil and wicked. He tells her they [that is, he and others] would put Sita on the throne, for that is where she belongs as Rama's 'half', since a wife is a husband's half. He tells Kaikeyi that if Sita goes to the jungle with Rama, then the whole city of Ayodhya too would go with them to the jungle. He warns Kaikeyi that even Bharata and Shatrughna would leave Ayodhya and go and serve Rama in the jungle. It is Sita who now speaks and insists that she too would dress like her husband and continues wearing ascetic clothes. During this poignant scene, Rama never loses his self-mastery once. Dasharatha now insists that Sita would not wear ascetic clothes and would go in clothes of silk. Kaikeyi does not object. Eventually the scene of actual leave taking comes. Rama, Lakshmana and Sita board the chariot. As Sumantra, the minister, driving the chariot urges the horses forward, a sense of loss spreads over the populace watching it. The whole city goes into a swoon. When they recover, the entire populace of Ayodhya run after the chariot like people tormented by thirst runs towards water. They beg Sumantra to drive slowly so that they could have another look at Rama's face. Women wail aloud filling the whole place with their anguish. Tears falling down from the eyes of weeping women so drench the earth that the dust raised by the chariot and thousands of men and women immediately settles down. Dasharatha comes out of the palace gates and seeing the disappearing chariot, falls down on the earth like a felled tree. When he comes to, he and Kausalya both begin running after the chariot. Dasharatha shouts at Sumantra asking him to slow down the chariot, to stop it. Again the one man still in control of himself is Rama. He turns around and looks back. He sees his mother and father and the masses of people running after him, and he knows the sooner this scene ends, the better it will be for all. While thousands of voices from behind ask Sumantra to slow down the chariot, Rama asks the minister to drive faster and faster. He tells Sumantra moving slow will not only increase everyone's sorrow, but might even have disastrous consequences. That is how Rama leaves Ayodhya. He would maintain tight control over himself for the rest of the day and two more days and nights. And then, when he is for the first time alone after he takes his orders from Kaikeyi, with just Sita and Lakshana with him, he would let himself go. So devastating is his grief now, held under check for three days and two nights, that when it comes out it is shocking not only in its power, but also in its nature. He now accuses his father of being a slave to Kaikeyi, who would do the meanest thing to please her. He accuses Kaikeyi of being an evil woman who can do anything for power, including poisoning Dasharatha to get rid of him to make her son Bharata's path easier for him. He speaks of the possibility of Kaikeyi poisoning both Kausalya and Lakshmana's mother Sumitra. He feels that Bharata would now enjoy all the pleasures all alone. He then wails aloud piteously in the solitude of the jungle, tears streaming down from his eyes. It is only after this that he eventually becomes calm like a fire without flames, like an ocean without waves. Self-mastery does not mean being untouched by emotions. A World War II movie shows us a shocking scene. Inside a moving train are several passengers, including an ex-soldier. Next to him is seated a young mother, with her baby in her lap. As the train makes its lonely journey through a dull, monotonous afternoon, the passengers fall asleep, including the mother. The baby slips down from her lap and slowly crawls dangerously towards the open door of the compartment. The ex-soldier, awake, watches it without a muscle on his face moving. Watching the scene on the screen, the entire audience holds its breath. But the soldier feels nothing and he does nothing to stop the baby or wake up the mother. This is no self-mastery by any standards. This is being dead. The ex-soldier hasn't risen to any spiritual height. What has happened is that he has become sub-human. What was human in him has died. What Rama shows through those three agonizing days is self-mastery of the highest kind. And it does cast a spell ' not only on the people of his time, but also over us, across a distance of a few millennia.